Step 1: Insert a mouthpiece into the mouthpiece opening. Step 2: Press the Power/Mode Selector Button. You will hear a beep and the unit will start to count down from 15 on the DISPLAY and say "Warm up". This warm-up process prepares the sensor. Step 3: When the countdown approaches 2, begin to inhale a deep breath.When the countdown reaches zero, you will hear a second beep indicating that you should blow into the mouthpiece. Blow through the mouthpiece until you hear a beep. This may happen at any point during the 10 second countdown. Step 4: Once the sensor has analyzed the breath sample, the estimated value is displayed. 1.The breathalyzer test comes with 5 piece mouthpieces on the back of the device, if you don't find them, please contact us as soon as possible. 2.Not include battery, you can search " LR03 battery" to buy three for it. 【FAST AND HIGH ACCURACY】The breathalyzer with professional airway design and high-precision semi-conductor sensor. 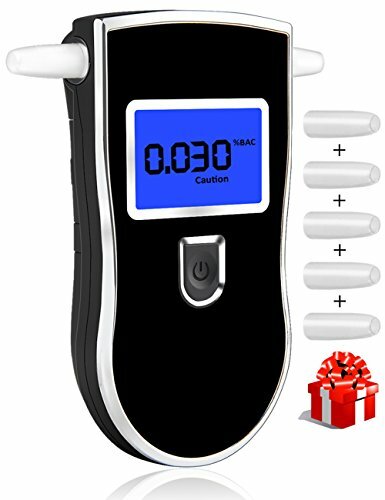 Alcohol breathalyzer detect trace amounts of alcohol only need 25 seconds, reliably handles high BAC levels and is accurate to the third decimal place. 【ONE TOUCH OPERATION】The brethalyzers are extremely easy to use. Simply insert the three included LR03 AAA batteries, power on your breathalyzer and begin testing. You are able to easily change units of measurements and set user-defined BAC thresholds for testing. 【PERFECT LED SCREEN】With blue LED display, LED screen flicker shows that it is in low battery.it will be much easier for night viewing. It will be auto shut off to save power after you finished the test for 20 seconds. 【FIVE PIECES MOUTHOIECES TO SHARE】Alcohol breath analyzer come with 5 pieces mouthpieces which are placed on the back of the device, and the mouthpieces can be cleaned and recycled. Will be much easier for your family or friend to test. 【WORRY-FREE WARRANTY】In order to let our customers buy this breathalyzer with confidence, we supply unconditional 30 days refund or replacement; and free lifetime technical support. If you have any questions about this product by WEIO, contact us by completing and submitting the form below. If you are looking for a specif part number, please include it with your message.